Kelsy Wooldridge, of Gillette, was one of 12 students in the University of Wyoming’s early childhood education program who gained insights they say will help them become better teachers during a three-week visit to Nepal this summer. 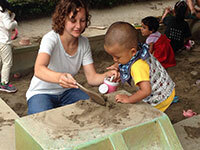 The students completed internships for their early childhood education and early childhood special education endorsements by teaching in classrooms in Kathmandu. This was the second group of UW students to make the trip to Nepal, following an inaugural visit by six UW early childhood students in 2014. The trip was arranged by early childhood faculty members Samara Madrid and Nikki Baldwin, who accompanied the students as supervisors after leading the first group in 2014. The students participated in a semester’s worth of study and dialogue before going. Supporting the group were the Cheney International Center, the UW Outreach School, and the Department of Elementary and Early Childhood Education. The students were placed in four schools serving children and families from a wide range of socio-economic backgrounds in Nepal -- including a school with high rates of poverty and homelessness; a preschool that might be considered upper-middle class; and a school that serves children of government officials, international families and private business people. “These different placements provided excellent discussion points regarding similarities and differences between student experiences,” says Baldwin, who notes that the students participated in individual interviews and group seminars, in addition to completing teacher-journals reflecting their experiences. Wooldridge taught at MotherCare International Preschool, with 10 students between 18 months and 3 years old. Madrid and Baldwin plan to take another group of students to Nepal in two years. Madrid is researching the impact of the international experience on the UW students, with plans to publish results in the next year.